VISIONTEK SM12 Single Phase Smart Energy Meter from Linkwell. Meter is designed to meter residential and small commercial energy consumers in distribution networks. Smart meter is an ac-static watt-hour meter that records electric energy in intervals of an hour or half and communicates to the head and system through a wireless communication network. 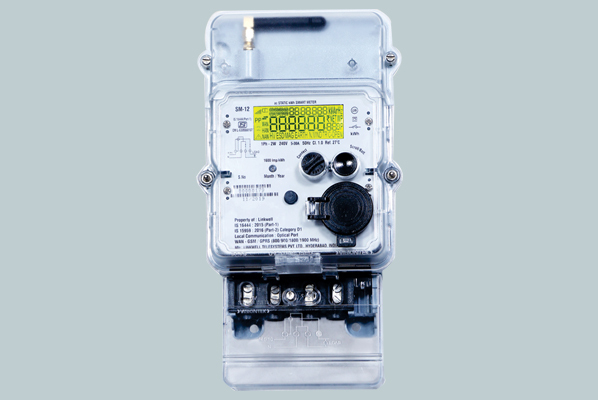 Meter also records energy with time of use registers, has internal connect and disconnect switches with two way communication capability. It is designed to measure the flow of forward (import) or both forward (import) and reverse (export), store and communicate the same along with other parameters. It can be remotely accessed for collecting data/events, programming for select parameters. Smart Meters also help the utilities to configure the meter remotely, download the TOD tariff remotely into the meter, unidirectional or Bi-directional (Net Metering), convert the payment mode from post-paid to pre-paid mode, etc... These features make the Smart Energy Meter a dynamic device in adapting to different conditions as per Utility requirements. Smart Meters not only benefit the utilities with their versatile features but also enable the consumers in managing their loads and empower the consumers to make choices about the usage of energy through real time information by interfacing the meter with in-home display units.